In the 1920s, The Warfield was a popular location that featured vaudeville and other major performances, such as Al Jolson, Louis Armstrong, and Charlie Chaplin. The theater opened as the Loews Warfield, named after David Warfield. It later became known as the Fox Warfield. New Life came to the Warfield in 1979 when Bob Dylan played 14 shows at the start of his first Gospel Tour in November 1979, and again 12 shows in November 1980 during his "A Musical Retrospective Tour". The Warfield had an appeal as a rock concert venue because it has more intimacy and better sound quality than an arena, yet has an occupancy of over 2,000 persons. The venerable hall has been rocking ever since. Like many historic theaters, its main floor had the seats removed in the 1980s for general admission and dancing. Prior to the removal of the seats, Joe Strummer of The Clash once refused to play unless the first two rows of seats were removed to allow for dancing. It is a favorite venue for performance among many entertainers. The Warfield served as a home for the Grateful Dead for many years. In 1980, the Dead played 15 sold-out shows there, featuring both an acoustic and two electric sets. The shows were a celebration of the band's fifteenth anniversary and done as a show of appreciation for their loyal fans. These, along with a sold-out 8 night run at New York's Radio City Music Hall were recorded for release as two double albums; one, all acoustic called Reckoning, the other, electric, called Dead Set. Jerry Garcia also made the Warfield a second home, performing a record 88 times there with his various side bands, when not touring with the Dead. On May 9, 1991, Guns N' Roses performed the first of a few "secret warm-up theatre gigs" prior to the official opening of their Use Your Illusion Tour. In 2000 Widespread Panic had a four night run where they honored the Grateful Dead spirit and played with Merle Saunders and Jorma Kaukonen. As is common with large music venues, there are a great variety of musicians scheduled. In 2001, thrash metal band Slayer recorded a home video there and released it as, War at the Warfield, in 2003. On November 12, 2003, hard rock band Korn performed during a small club tour, which is a rarity for the band. Green Day played at The Warfield on the 13th October 2005, they played the whole of their American Idiot album from front to back and a number of their previous songs in their catalog and covers ranging from "Shout" to "Blitzkrieg Bop". The Killers played there on December 12, 2008, after previously canceling their show on November 21, due to an unknown injury. In May 2008, The Warfield changed management. The final show with Bill Graham Presents performance by Phil Lesh ran until 3:30 AM, May 19, 2008. The venue was closed pending renovations by new lessee, Goldenvoice/AEG Live. The venue was scheduled to reopen in September 2008, with George Lopez to give the first performance. In September 2011, Dream Theater played their first U.S. show with Mike Mangini on the Dramatic Turn of Events Tour at the Warfield. This was their first show in the U.S. without founding drummer Mike Portnoy. ^ Joel Selvin (2008-07-03). "Battle of the Bay Area concert promoters". San Francisco Chronicle. ^ "GNRontour.com - GN'R Setlist Almanac 1991". 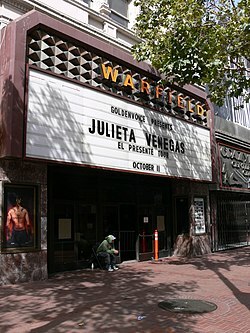 Wikimedia Commons has media related to Warfield Theatre. This page was last edited on 6 February 2019, at 00:58 (UTC).